In the heat of the summer, Fossil Creek is the place to be -- a gorgeous and refreshing swimming spot located just between Camp Verde and Payson. But, preparing for thousands of visitors starts now and happening Monday, forest officials will be holding a public meeting to hear your input on possible changes to the popular recreation area. CAMP VERDE, AZ — In the heat of the summer, Fossil Creek is the place to be -- a gorgeous and refreshing swimming spot located just between Camp Verde and Payson. But, preparing for thousands of visitors starts now and happening Monday, forest officials will be holding a public meeting to hear your input on possible changes to the popular recreation area. "As more and more people became aware of the opportunity and started to visit it, we saw this really dramatic increase in visitation," said Fossil Creek Project Coordinator Marcos Roybal. He said that now the average is at 90,000 visitors a year. 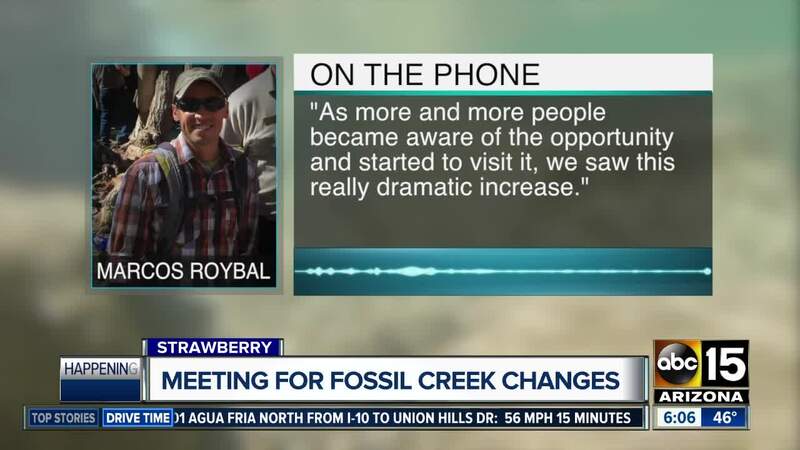 "Demand for access to Fossil Creek is just going to continue to increase as time goes on," Roybal said. Roybal is working to get information out to the public about their Draft Comprehensive River Management Plan. "One of the big challenges that this plan is tackling is... as use increased... there really weren't a lot of facilities and infrastructure, like parking and restrooms and things like that," Roybal explained. So, this new plan will present five management alternatives that officials hope will sustain the park over the next few decades. They are looking to add these items while still keeping the environmental impact low. "The goal of the plan is to protect and enhance Fossil Creek's free flow, water quality, and its defined outstandingly remarkable values while providing for public use and enjoyment of this unique Arizona environment," the department said in a press release. "The CRMP includes forest plan amendments and proposes management direction, monitoring, and adaptive management to help accomplish this goal. In recent years, Fossil Creek has experienced a dramatic increase in recreational use, leading the Forest Service to implement interim management measures, including a seasonal reservation system." "The Fossil Creek river corridor is the only intact perennial system with continuous flow without any water diversions in Arizona and is the only uninterrupted river system between the Verde River and the Mogollon Rim. As such, it spans and connects a number of biotic communities from upper Sonoran desert scrub through ponderosa pine forests. This creates a diversity of habitat for wildlife, fish, and plants, and hosts unique travertine geology and a rich cultural history," the release went on to write. "If a member of the public was in the shoes of the forest service decision-maker...how would you approach those challenging decisions and balance those trade-offs that are inevitable in making a challenging decision like that?" Roybal asked. Electronic: E-mail to comments-southwestern-coconino-redrock@fs.fed.us (include "Fossil Creek CRMP" in the subject line). To view the plan and environmental impact, click here .